Megapodes are unique to the bird world as they are they only Family that do not build a nest and incubate their eggs with their body heat. Instead, most megapodes, including the Orange-footed Scrubfowl, build a large mound, heaped up with organic matter and expertly tended so as to generate heat by the composting process. 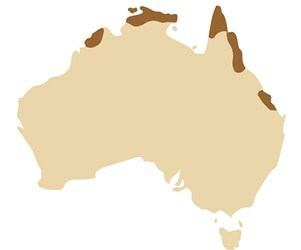 The Orange-footed Scrubfowl is found across the north of Australia (brown shaded area), New Guinea, Indonesia and Philippines. Common in gardens and monsoon forest areas close to Darwin city. Easily seen in the botanical gardens. Monsoon forest specialists, sometimes on the edge of mangroves and in leafy, well established gardens. Observations suggest that their diet consists mostly of small arthropods and the occasional fallen fruit. They spend most of the day foraging or tending to the mound, and roost in trees at night. Orange-footed Scrubfowls have a strong pair bond. Pairs will often call in a duet, meaning they synchronise and overlap their calls. This is remarkable because very few birds do this (Magpie-larks and Eastern Whipbirds are two species that are well known for it) and those that do are usually songbirds. The Orange-footed Scrubfowl is one of the most 'primitive' of bird species yet practises this complex behaviour. The mound is a large heap of mostly decomposing organic matter. The male works tirelessly, turning the top layer of the mound, maintaining the heat producing decomposition process. This is done for most of the year, with the exception of the peak of the wet season. 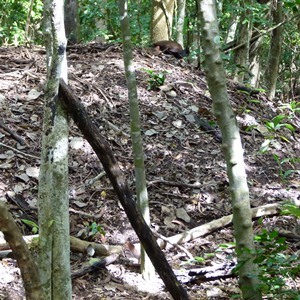 While most mounds are in the forest where there is an abundance of leaf litter, there is an active mound near the mangrove boardwalk at East Point Reserve that is mostly sand with very little organic matter, and less shaded than mounds in the forest. Possible the solar warmth of the sand here makes this mound successful. The female works hard foraging for enough food to enable her to produce an egg that is more than 20% of her body mass. 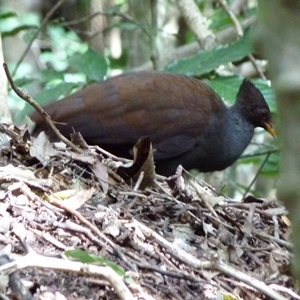 She lays an egg, about 45cm deep in the mound, at intervals of 9-20 days. The incubation period is thought to be 50-80 days. When the chick is ready to hatch, it trashes the egg with it's strong feet. It's sharp claws have small sheaths, protecting it's face from being scratched during the hatching process, these drop off after hatching. The chick rests in a small cavity in the mouind before emerging, 24-48 hours after hatching, and flies away! They are completely independant of their parents and recieve no assistance from them. The full focus and attention to caring for the young has been invested in the impressive mound, and that's the parenting done.